Abby is one of those reasons why. A few weeks ago we were at the City of Tulsa Animal Welfare photographing their available dogs and cats. Cailyn, one of my wonderful volunteers, brought out this beautiful little red Pit Bull named Abby. As usual, I dropped to the ground to meet Abby and was summarily covered in kisses. Then I took a moment to look closely at her. She was covered in little white scars. She had open cuts on her legs. Scabs were everywhere. The sweet little girl looked like she’d been through hell and back. A lump formed in my throat and tears filled my eyes at what horrors she must have known. Nothing was known of her background, but given what I’d seen of her body, she had a rough hand dealt to her at some point in her young life. We took Abby’s photos, then I promptly went home where I made a Facebook timeline cover for her and made her my “poster dog of the week” on TylerDog’s Facebook page where she was shared over 500 times. Lots of interest, lots of comments, but no takers. Then came the word: Abby’s time was dwindling because she wasn’t doing well in the shelter. Many dogs, especially Pit Bulls, don’t do well in a high-stress shelter environment where it’s constantly noisy and they seldom get a chance to get outside, if at all. Some dogs become depressed, aggressive, fearful or a combination of all three. Abby was developing issues and knowing that made her less adoptable, it meant Abby was going to die unless someone stepped up for her. We all frantically started networking her. Only a couple days later, a friend of a friend of a friend shared Abby’s photo with a wonderful woman in Austin, Texas. She immediately fell in love with Abby because she reminded her of another rescue they had years ago. She said she was a sucker for the photo! Next thing you know, Abby is being spayed, her paperwork drawn up, and she’s ready for a roadtrip! A dear friend of mine, Renee Baldwin, picked up Abby last Friday evening. At 4 a.m. Saturday, with Abby safely strapped in, Ms. Renee started the long trek from Tulsa to Austin and back, all in the same day! 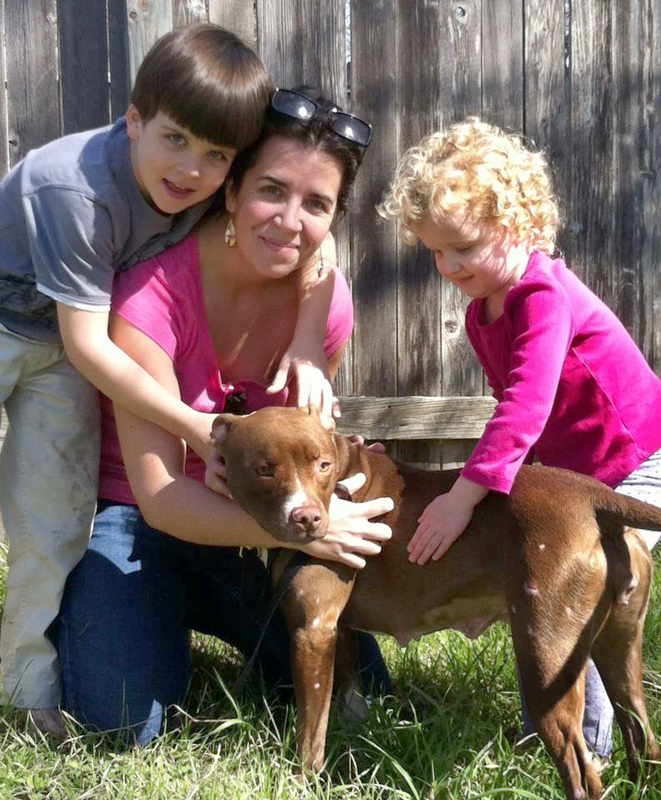 Seven hours and 450 miles later, Renee delivered sweet Abby to her new Mom and Dad, along with two human siblings! Jen’s kids love her already! Below is an iPhone pic Ms. Renee sent me of the new happy family! 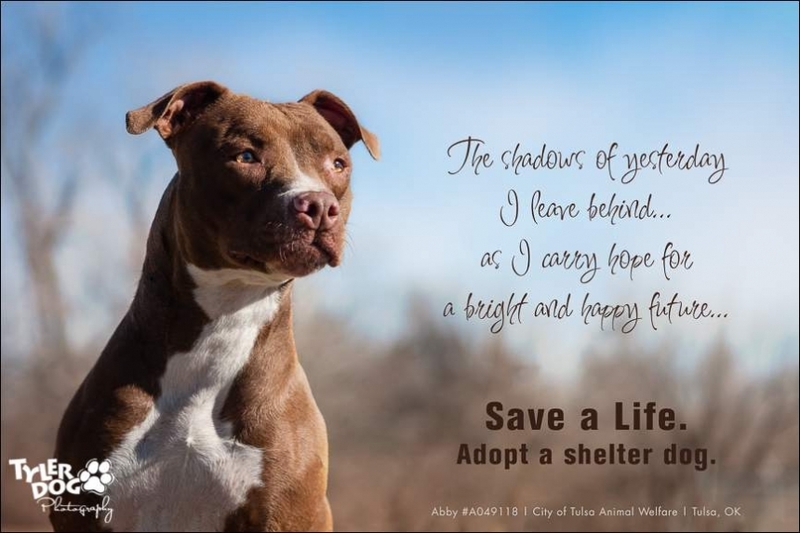 Every single person involved – from the photo shoot, the volunteer handlers, those who shared and networked on Facebook, the shelter workers who cared for her, to Renee the transport warrior, and the family who opened their heart to her – had a hand in saving Abby. From a death sentence to happily ever after. Enjoy your new life, Abby. You deserve it.